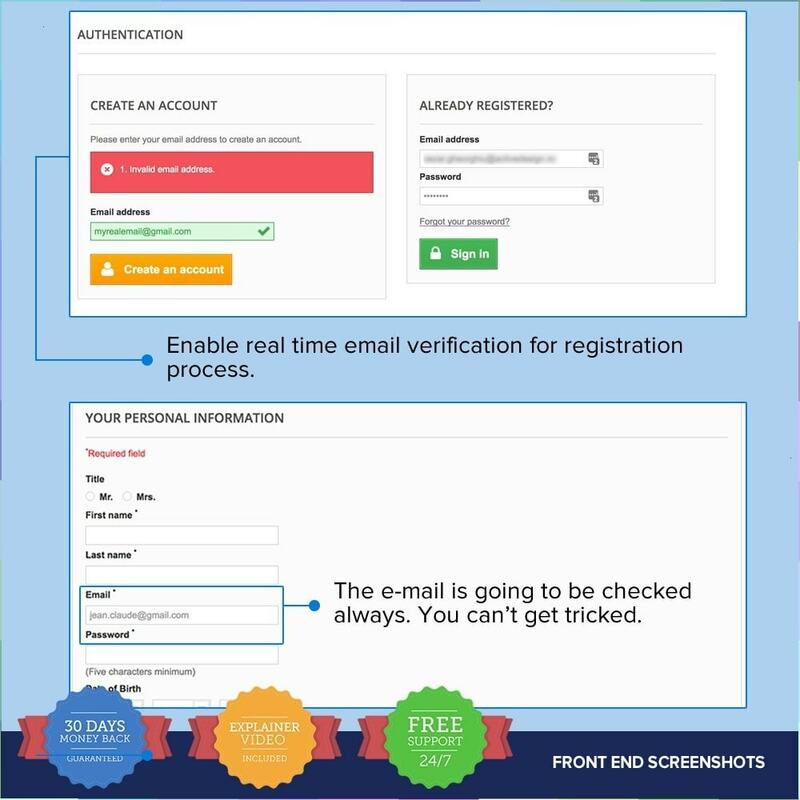 Real Time Customer E-mail Validator Prestashop module gives you the option to activate a real time email verification to your registration form, guest checkout form and contact form. Real Time Customer E-mail Validator module is easy to install and use. To install, simply upload the zip and start the web based Installation via your Prestashop back-office. Also, we can perform the installation for you, at no charge. 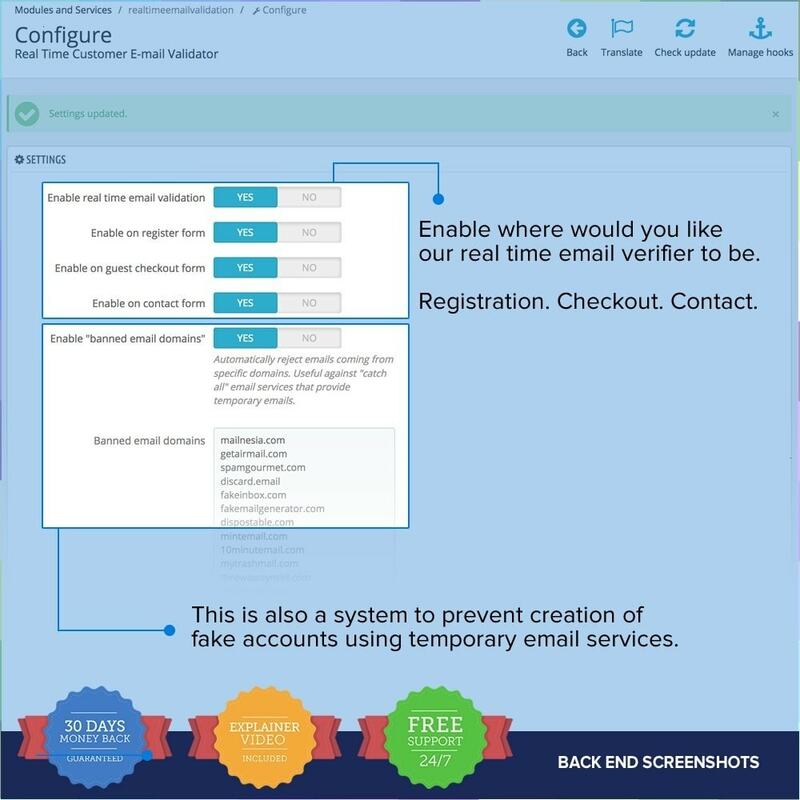 Real Time Customer E-mail Validator is the most complete and flexible system on the Prestashop marketplace. 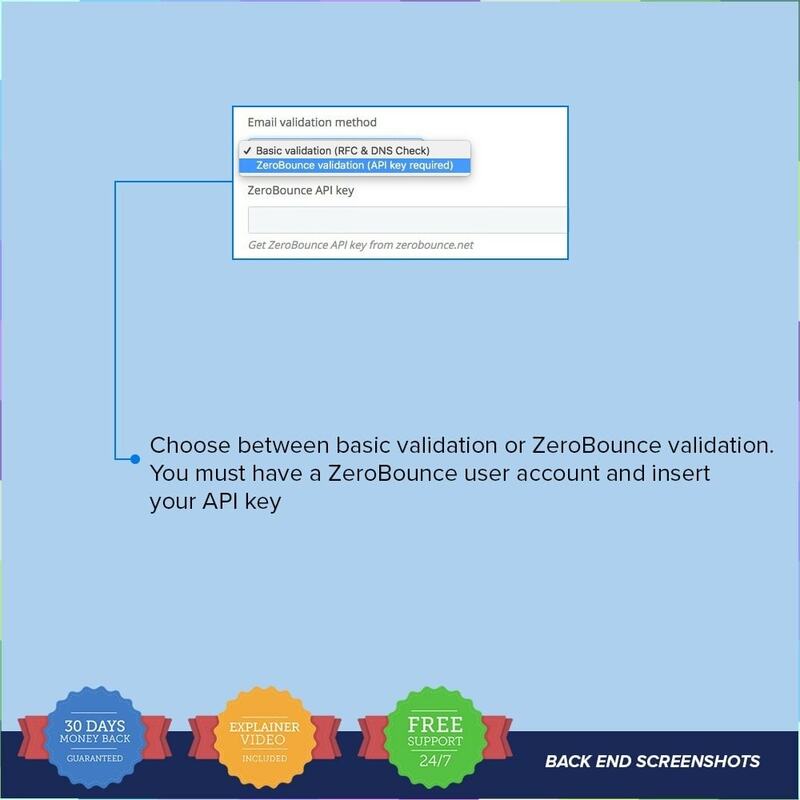 To use ZeroBounce validation, you have to be registered on the ZeroBounce website and insert the generated API key, in your back office. 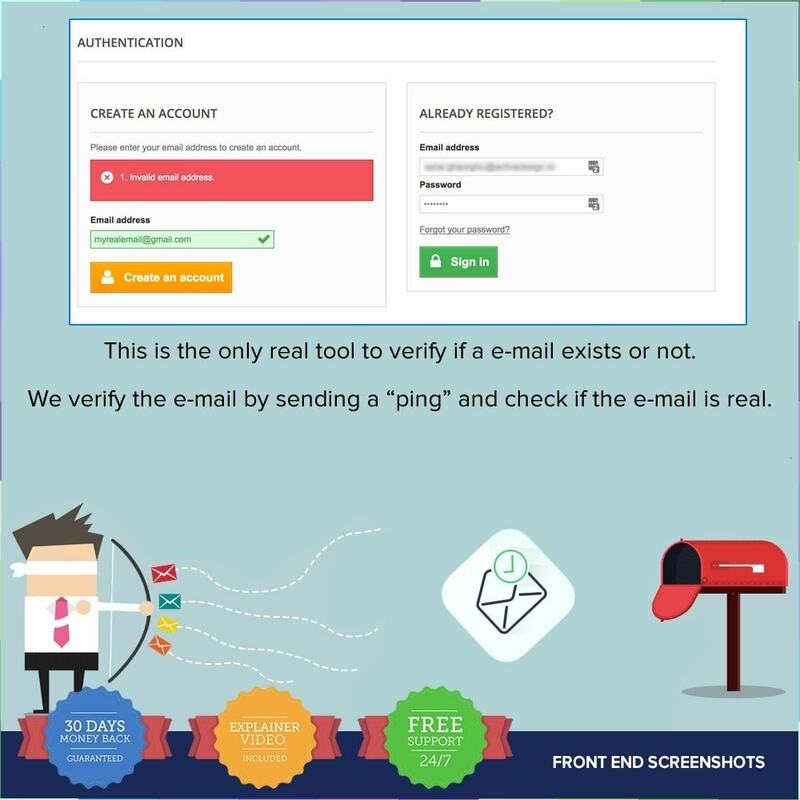 - Real time verfication of the e-mail in registration form. - Real time verfication of the e-mail in check-out as a guest form. 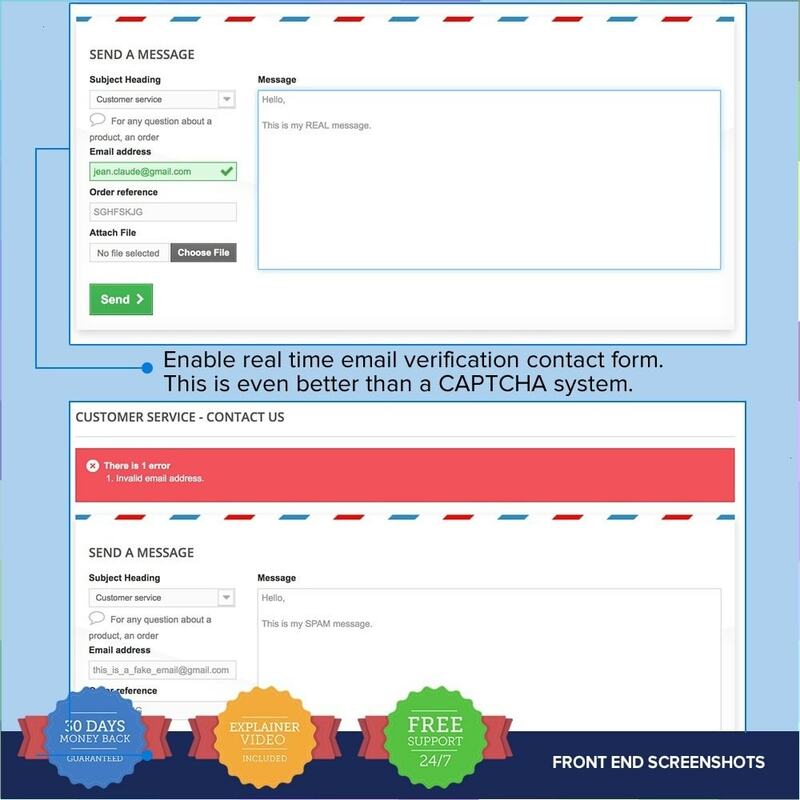 - Real time verfication of the e-mail in contact form. - Enable/Disable verfication of the e-mail in registration form. - Enable/Disable verfication of the e-mail in check-out as a guest form. - Enable/Disable verfication of the e-mail in contact form. - Enable/Disable blacklisted email domains used for generating temporary emails. - Update the black listed email domains. - Choose between two validation methods: Basic validation ( RFC & DNS Check) or ZeroBounce validation (API key required). - Make sure your users will never type in a wrong email address. We are a Prestashop oriented company, so we develop Prestashop products since 2007 with hundreds of implemented projects, and dozens of modules uploaded, we will offer you fast and quality support.